I had a bit of a hard time coming up with (another) Valentine's Day manicure idea that I was really excited about this year. I actually love Valentine's Day—any excuse to pick out a gift for the Mr. and eat chocolate, after all!—but the traditional pink/hearts/sparkles just weren't inspiring me. 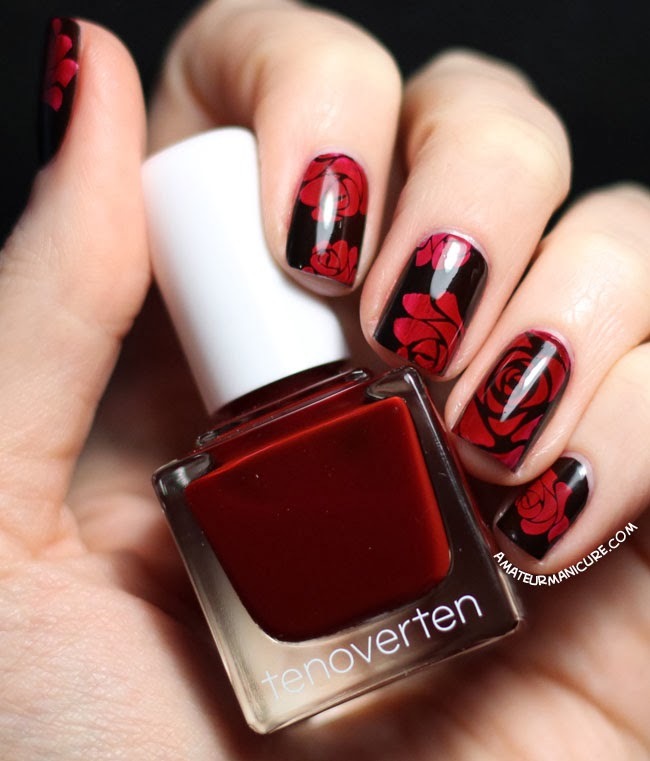 Eventually I hit upon the idea of focusing on my favorite Valentine's Day flower, roses, and I stumbled upon this look while messing around with my stamping plates and a bunch of different color combinations. 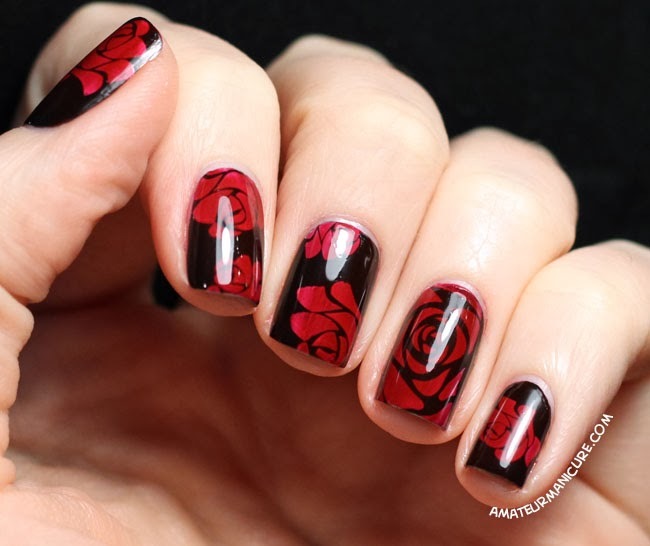 I really wanted red roses on a black background, but I don't have a stamping plate that has an image of the negative space around a rose, and none of my reds stamped well at all on top of black. As a last resort, I stamped on some roses in white onto my black base and then painted over the whole nail with one of my more sheer reds, and—bingo! It worked! Red roses on a background that still looks black. 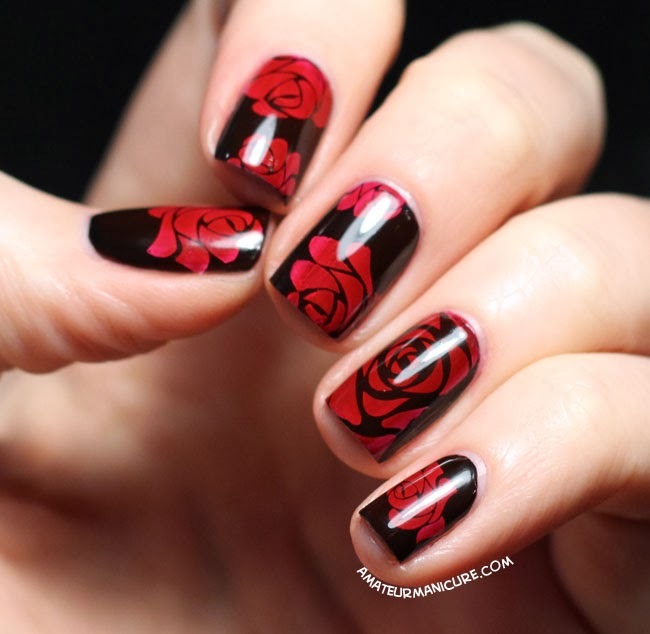 I used Essie Licorice for my base, and then stamped on the roses using essence white stamping polish and the Messy Mansion MM07 plate. (By the way, everyone probably already knows this, but Messy Mansion plates are amazing—they're really well etched and every single stamp came out perfectly. I can't recommend them highly enough!) Then I added a thin coat of tenoverten Carmine to each nail and sealed everything with topcoat. And once I realized what I was doing, I couldn't help but hum the "Painting the Roses Red" song from Alice in Wonderland to myself the entire time. 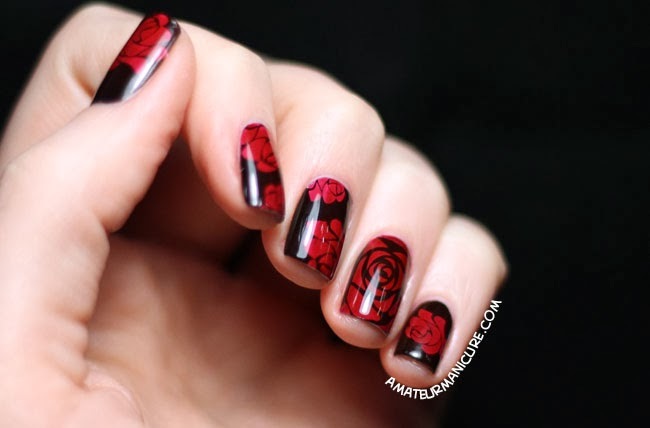 I really love how this turned out—the roses looks so deep and rich because of how the stamping is sandwiched between the two colors. I'll definitely be trying this technique again the next time I want to stamp a color onto black! I wish I'd dragged out my light box to shoot a few of the pictures so that the lamp glare wasn't such an issue (the dark colors and extremely shiny finish from the HK Girl top coat I used make the glare especially obvious), but that's my only minor regret here. Lesson learned for next time! What an amazing discovery! Oh, my, gosh...so many techniques could blend with your idea...sponging, gradations/ombres, detailed painting over just the image stamped in white...I'm sure even more. Congratulations! This mani is just sooooo beautiful! I just realized: this is similar to the pond technique only without the many layers of the sheer jelly polish, and with the ability to lend even more depth because of the black base polish. Really, very cool. Oh...just in case you're not sure what I mean by "pond" technique: the pond technique. It was created by a woman named Vicki. She showed her creation on reddit at http://www.reddit.com/r/RedditLaqueristas/comments/1ck1tq/first_jelly_sandwich_flowers_on_a_pond/. She then started a blog. Her post about creating the first pond mani is at http://oliveviewfashion.com/2013/04/21/the-manicure-that-started-it-all/. Thank you! :) And thanks for linking to the pond technique, too—I hadn't seen that before. So pretty! You are a GENIUS for this idea! I've been telling all my fellow stamping lovers! Beautiful manicure!